A Hawaiian man has claimed the Guinness World Record for the largest non-surgically made stretch earlobes - which are so big you can fit a hand through them. 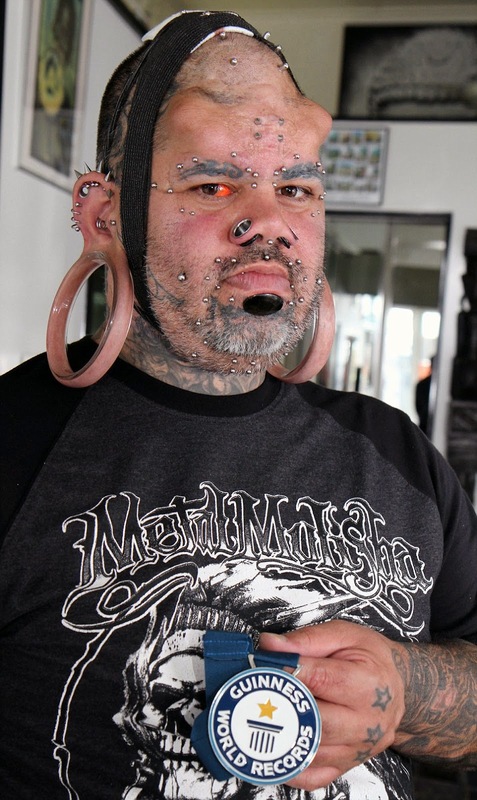 Kala Kaiwi, who unsurprisingly works as a tattoo and body modification artist, has earlobe stretches or 'flesh tunnels' measuring 109mm (4.3 inches) in diameter, to go with his hundreds of other wacky body adaptations. He has just returned from Milan, Italy where he picked up his award, almost certainly setting off airport security scanners on his way. Along with his flesh tunnels, he has had silicon horns implanted on his head, stretches in his nostrils, tattooed eyebrows and studs all over his face. He even split his own tongue using dental floss, and has bolt holes on his forehead with spikes screwed in. Kala trained in Las Vegas in 1999 before moving back to Hawaii to open Sin City Body Modification and Tattoo shop.